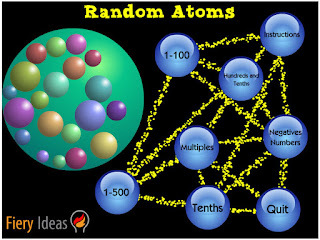 The Random Atoms resource by Fiery Ideas would be a wonderful classroom resource if you were studying probability, if you wanted to create math problems with random numbers, or if you were playing math bingo. The main menu allows you to choose what types of numbers you want the randomizer to display. Choose from whole numbers, hundreds and tenths, negative numbers, multiples, and tenths. Once you choose the type of numbers, you can use the sliders at the bottom of the activity to set your limits. For example, in the multiples number generator shown here, I have chosen multiples of 4 up to 10X. 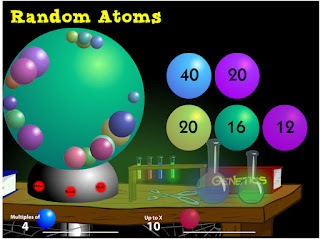 Click new below the spinning number machine and the robot will grab a random number for you. You can display up to nine random numbers and then reset to grab more. Duplicate numbers do pop up.